Sunday, 28th October - We are supposed to have our usual weekly Sunday morning ride but due to the rain pouring down in the early hours thus causing the road to be wet, we decided to cancel the ride. Its not that we don't want our bicycle to get wet and dirty or for us to get sick because of the rain, its just that last week, when we were cycling from our home base to Bukit Shahbandar, along the highway, we saw 4 dead dogs along the route. Luckily, at that time it was dry, just imagine if it is wet and raining.....that wet dead animals....with its intestine coming out all smash up....and then you pass by with your bike....the water splashed all over you and your water bottle as you pass by the dead animals......yuck.. So instead of continuing back my sleep, I went to the swimming pool and have my swim training. This coming 11th November will be my third consecutive Panaga Triathlon participation and for this I've decided to do the full event which is 500m pool swim, 28km bike and 5km run instead of the sprint triathlon i.e. 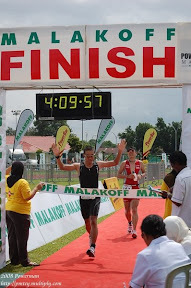 300m pool swim, 14km bike and 2.5km run which I have been doing it for the last 2 triathlon.